The Madman have advised me that Ben 10 returns in December! Ben 10 is in incredibly popular series which airs on Cartoon Network and Channel 9 here in Australia. Everywhere you look there are kids with Ben 10 shoes, hats, shirts and Omnitrix's's's. I have to be honest, I really dig it myself too! 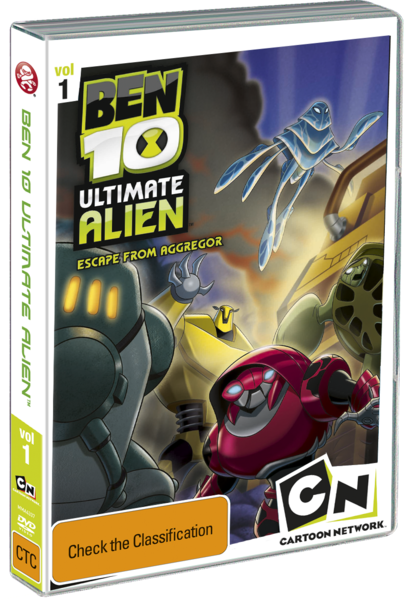 Ben 10: Ultimate Alien volume 1 of 7 is getting a December release here in Australia, just in time for Christmas. The perfect stocking stuffer! I'm also a big fan of Madman. They are the premiere source of anime here in Australia and thankfully they have also branched out into traditional anime and Adult Swim titles. I have an absolute load of Madman anime DVD's in my collection! They seem to be one of those companies that is run for fans by fans... it shows. Every kid's favourite alien-morphing hero is back! Ben Tennyson is now 16 years old, and his superhero identity has been revealed to the world. Now, on top of dealing with his parents, school and his super powers, he's now constantly surrounded by screaming fans! Loved by kids the world over but distrusted by the adults, he is now armed with the powerful Ultimatrix, which allows him to transform into ultimate alien versions of his old familiar aliases. 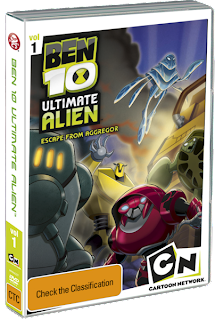 In addition to new and ultimate versions of his aliens, Ben must also deal with his most formidable adversary yet, Aggregor! For Ben 10, it's not easy being the world's only famous superhero, but the perks are awesome!